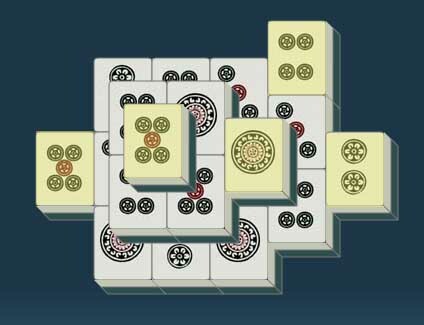 Mahjong is a tile matching game where you need to remove all the tiles from the layout by matching those with the same face. There are many layouts to choose from and the tiles are placed in each layout in a 3-dimensional way. You remove the tiles by clicking/touching a free tile and then clicking/touching another free tile with the same face. A tile is free if there are no tiles above any part of it and it has either no tile immediately touching it to the left or no tile touching it to the right. In the example below, the yellow tiles are the ones that are free and you can see that there is only one possible match. When you select to play, you will first be presented with the Options screen. Options will be remembered for the next time you play on the same computer. Layout: This is the layout of the tiles. You can change the layout by clicking/touching the "Change" button. Time Attack Mode: If you select this, the game will have a time limit. How long the limit is depends on the number of tiles in the chosen layout. You will be asked to enter the number of seconds per matching pair. So, for example, in the classic layout of 144 tiles (72 pairs), if you enter 5 seconds per pair, the time limit for the game will be 72 times 5 seconds, ie 6 minutes. The scoring is a little different for Time Attack (see below). Sound Effects: Check this if you want sound effects. - You score 100 points for every pair of tiles matched. - Each time you undo, you lose 150 points. - Each time you request a hint, you lose 250 points. - Each time you ask if any more matches, you lose 50 points. - If you are playing in Time Attack Mode and you complete the game before the time limit, you score a bonus of 50 points for every second remaining. If you are not playing Time Attack, on completion a time penalty of 5 points per second is subtracted from your score. New Game: This will shuffle the tiles to give you a new game for the current layout. Restart: This will restart the current deal of tiles. Undo: Will undo the last pair removed. You can undo right to the beginning. There is also an Undo button next to the menu for your convenience. Hint: Will tell you how many immediate matches are available and highlight one tile from those matches. Note: Choosing tiles suggested by the hint will not necessarily lead to a successful solution as prior moves may have made this impossible. Matches? : Will tell you if there are any more matches without giving away further information. Solve: Will solve the rest of the puzzle (if the program can). Failure to solve does not necessarily mean the puzzle cannot be solved from that point but the computer is not able to do so quickly. However, all puzzles are solvable - you may need to undo steps and try alternate sequences of moves. Change Options: Will let you choose a new layout or the other options - the current game will be discarded.